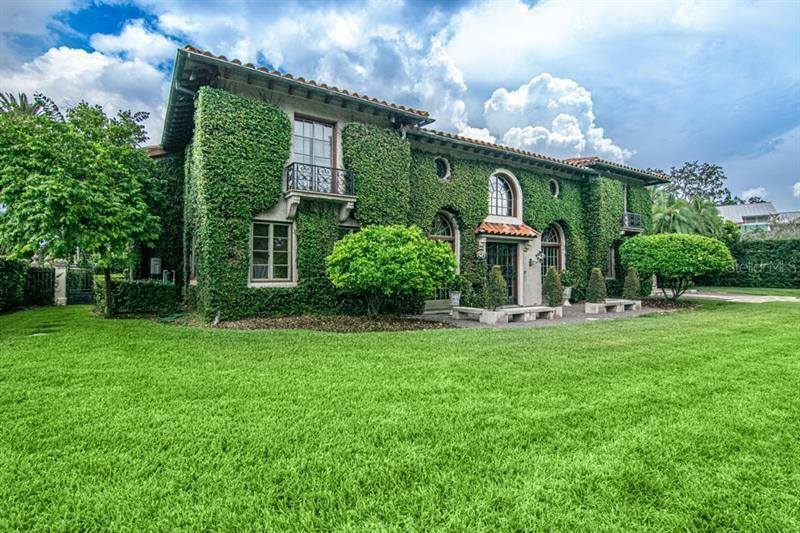 Gorgeous 1925 Davis Islands Estate sits on nearly Â½ acre of beautifully landscaped grounds. The home was designed by Franklin O. Adams, for V.P. of the D.P. Davis Properties, Arthur Milam. This historical icon was built for entertainment with a high degree of craftsmanship and is maintained and updated to keep with the historical integrity. The 2300 sq ft addition by Soleil added a family room, laundry, foyer, master suite, pool and more. The architectural elements of the original home were carried into the addition w/ custom matched rafter tails, reused original windows & imported antique materials for flooring & hardscape. All upgraded electrical service, tankless gas water heaters, water softeners, gutters & downspouts, central heat & air custom by Caldeco, and in 2000 the home was rewired and complete interior restoration by Gene Pail Nesgoda. A chefs kitchen with pantry and casual dining area is adjacent to the open family room. French doors lead to the loggia with full outdoor kitchen, and overlook the pool and spa. There are 2 grand staircases and an elevator & the main house has 5 en suite bedrooms and 3 half baths. The downstairs includes, the focal point of the home a 2 story dining hall which opens to both the front lawn & back French limestone Fountain Courtyard, custom designed bar inspired by Columbia Restaurant, dining room, study and mud room. A gated antique Burgundy cobblestone parking court allows for extra vehicles, along with the 2 car Carriage house with in-law suite and full bath.